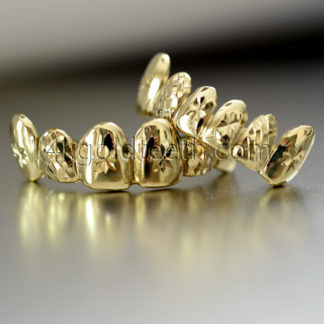 People do not have to dream about having their own pair because they can get their own right here at 14kgoldteeth. We want all of our customers to rock their set of gold teeth and smile confidently while walking through the crowds. We offer all different kinds of styles, designs, and sizes so that customers can customize their own pair. 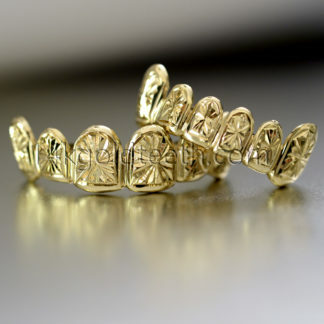 We offer top and bottom yellow gold grillz for both the top and bottom row of teeth. There are a variety of designs that we can create, and our most popular design is the solid yellow gold. Some of our other designs include diamond cuts, diamond dusts, and symbols such as a star, marijuana leaf, and frosty designs. There are endless possibilities that customers can choose from, and if there is not a particular design that he or she is interested in, we can always create a custom order design as well. Because we offer products in both the top and bottom, there are many different pieces that can be created. The number of pieces that we offer is 4pc, 6pc, and 8pc for both the top and bottom. Customers can mix and match their number of pieces if they would like for each of their row of teeth. Depending on their preference, customers can order a 6pc for both the top and bottom, or some customers may order a 4pc for the top and 6pc for the bottom. For any other number of pieces that are not listed, we can create it as a custom order. Because we are a custom designer, we can tailor our products to the needs and wants of our customers. All of our top and bottom products come in a variety of metals that customers can choose from. We offer three types of gold and silver products. For our gold products, customers can choose the number of karats that they would like from the available options. Our yellow gold products come in 10k, 14k, and 18k. Our white gold products only range from 10k and 14k. We can also create rose gold products under a custom order as well. Our silver products are all 925 sterling silver. If customers would like to order both a top and bottom product in two different metals, they can do so by contacting our customer service to create a custom order. All of our customers have different preferences so we do everything that we can to make our customers happy. Customers love the option that they can create their own look and have everything tailored to their liking. 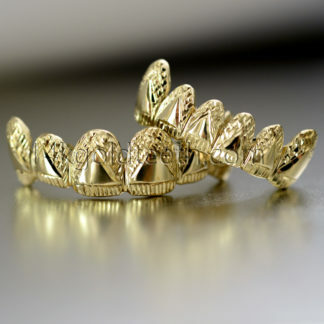 We want to create the best looking pair of grillz for all of our customers. 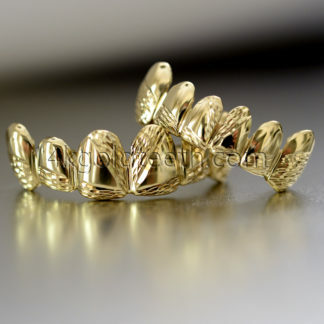 Should I buy gold teeth? 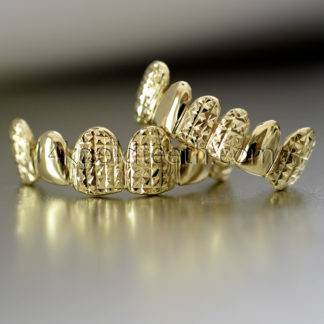 Grillz is a fashion jewelry that is on the rise today. Many people wear grillz for various reasons, such as going clubbing, going to a special event, or to show off their teeth to the crowd. 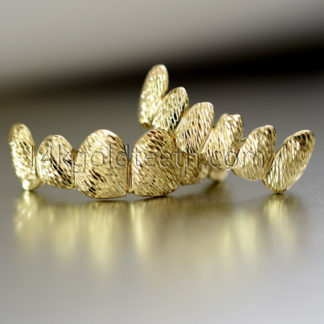 Whatever the reason may be, wearing gold teeth can certainly revamp your entire outfit. Smiling is one of the most important features that a person can display. Imagine smiling while wearing bejeweled pieces of jewelry in your mouth. Everyone will be staring at the shiny product that you are wearing so confidently. Wearing grillz is a great way to boost your confidence, and it can also help you become a more stylish person. Whether someone wears a solid design or an iced out design, our custom gold products are created to fit and feel perfectly so that our customers can feel their best in them. Will my teeth get damaged by wearing grillz? Our products are all custom made to fit perfectly into each customer’s mouth. Because we create the products according to the mold impressions that our customers create themselves, the grillz will not damage any teeth. All of our products do not have any harmful chemicals in them. While some other companies create plated products, all of our products are authentic gold or silver. We guarantee that all of our products are real yellow gold, real white gold, and real sterling silver, so customers do not have to worry about the possibility of any harmful chemical being present in their product. Although our product is not permanent, it does have a permanent look. The product will be able to easily put on and take off without damaging the teeth due to the custom fit. 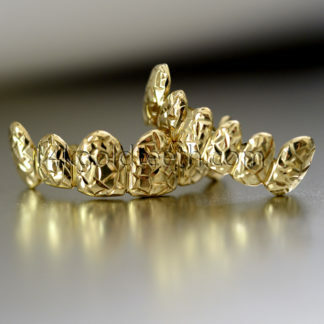 In addition to the custom fit, customers should also take precaution by properly cleaning their grillz. The cleaning process is simple. Customers can take a toothbrush and toothpaste to gently brush the grillz in warm water and pat dry with a towel when finished. Cleaning the product once a day can help prevent buildup in the product. With proper care, the grillz will not damage customer’s teeth due to the custom fit and design of the product.